Intelligent call reporting enables your team to gain critical insights from one of your most valuable business communication tools, your phone system. Our call reporting system is a business analytics tool that pulls and organizes your telephone data, in any configuration that you need, and provides the option to drill down as far as necessary to help you make intelligent business decisions. For contact or customer service centers, call reporting can be configured to cater to the many unique data reporting needs of enterprise contact centers. Contact center managers know that data is vital to the ability to design the best customer experience possible. 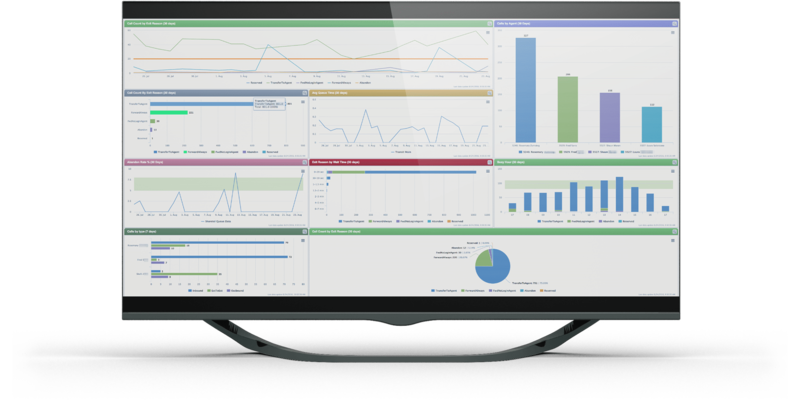 Real time dashboards are ideal for contact or customer service managers who are in the trenches and gives them the opportunity to adapt and change the way your employees meet customer needs. Our call reporting solutions are much more than the average phone metrics reporting tool. We deliver intelligence analytics to facilitate better business decisions for your organization.